The editor of Horse Sport International, Pamela Young, joins me to discuss the international controversy surrounding the welfare of horses in the sport of endurance and letters from National Federations to the FEI calling for specific action. These topics are being covered in the current issue of Horse Sport International - http://www.horsesportinternational.com. Follow us on Twitter @horsesportintl and @chrisestafford. Horseman John Howe joined an exclusive club on the weekend when he notched up 10,000 kilometres of endurance riding. The milestone was achieved during the Mudgee Endurance Ride on Sunday. Howe and his trusty horse Ashbend Perazzi, or Ears as the 12-year-old is known, were given an enthusiastic applause when the pair crossed the finish line. Howe was only able to celebrate the milestone once the vet gave Ears the all clear after the 83km event. “I got the thumbs up from the vets and it was absolutely fantastic,” Howe said. It has been a journey 26 years in the making and one that would not have begun if it weren’t for cricket. May 24, 2013, Compiegne, France ~ The UAE’s Saeed Ahmed Jaber Al Harbi prevented a clean sweep by the French riders in the FEI 3 *160 Nations Cup Endurance in Compiegne, France, which was supported by the HH Sheikh Mansoor Bin Zayed Al Nahyan Global Arabian Horse Flat Racing Festival. French rider Julien Goachet on Quran El Ulm finished first in this important 160-km ride with the Emirati rider Al Harbi on Reef Beethoven in second place and another French rider Laurent Mosti on Reve De Sauveterre in third in this highly testing event. Abu Dhabi: The UAE’s Saeed Ahmad Jaber Al Harbi prevented a clean sweep by home riders in the 160-kilometre endurance in Compiegne, France, which was supported by the Shaikh Mansour Bin Zayed Al Nahyan Global Arabian Horse Flat Racing Festival. French rider Julien Goachet on Quran El Ulm finished first, with Al Harbi on Reef Beethoven in second place and another French rider Laurent Mosti on Reve De Sauveterre in third. Goachet finished in 7 hours 42 minutes and 36 seconds at an average speed of 20.57 kmph. Prominent European federations are pressuring the Fédération Equestre Internationale to “clean up” endurance riding in the Middle East, citing the high incidence of doping and equine fractures in the area. Mountains, valleys, forests and rivers - it's no wonder our prehistoric forebearers chose to settle here and raise the mysterious and timeless standing stone circle at Castleruddery. All was just as beautiful and mystical for the setting of the recent ILDRA endurance ride, organised superbly (as usual) by Sam Hawkins and his capable team of helpers, Larry O'Neill, Nicki Boud-Tighe, Emma McCarthy and Gillian Moody, with the veterinary expertise of Barbara Fonzo available to assess the horses competing. Dubai’s ruler has banned the use of steroids in the United Arab Emirates as he seeks to stem the widening doping scandal at his Godolphin stables. Sheikh Mohammed bin Rashid Al Maktoum, who is also the UAE prime minister, said he had ordered the drafting, with immediate effect, of legislation criminalising the import, sale, purchase and use of anabolic steroids in all horse-related sports. Abu Dhabi: Nearly 200 riders and teams from 22 nations will in action over the next two days in Compiegne, France, with the support of the Shaikh Mansour Bin Zayed Al Nahyan Global Arabian Horse Flat Racing Festival. Many of the UAE’s leading riders, including European Open champion Ali Khalfan Al Jahouri and his son Khalifa Ali Khalfan Al Jahouri, who has won many rides in the UAE this season, will be representing the Al Wathba Stables, which are owned by Shaikh Mansour Bin Zayed Al Nahyan, Deputy Prime Minister and Minister of Presidential Affairs. If it had been a three-day-event, it probably would have been cancelled, but the endurance riders at last week’s Golden Horseshoe Ride over Exmoor are made of sterner stuff. Glen Innes endurance horse rider Jenny Annetts has recently broken a record and won an event. Manama, May 23 (BNA) -- Bahrain's Royal Endurance Team is supporting a 120km Endurance Horse Ride, part of the Compiegne Festival Mondial d’Endurance, to be held on Sunday at Compiegne near Paris, in France. Team captain Shaikh Nasser bin Hamad Al Khalifa will lead a group of prominent Bahraini riders in this two-day festival, which also includes a 160km ride, set to take place today. Shaikh Nasser will be racing alongside Yaqoub Al Hammadi, Raed Mahmood, Mohammed Abdulsamad and Abdulrahman Al Saad this weekend. Fresh from their participation in the recently-concluded Windsor Show in the UK, the Bahrain delegation moved to Compiegne, a commune in the Oise department in northern France, ahead of today’s event, which is sponsored by Shaikh Mansoor bin Zayed Al Nahyan of the UAE. FOR the Tenterfield Endurance Riders Club, the weekend of May 4-5 was a big one. It was the 27th consecutive ride the club has staged. It was the second biggest endurance ride held in Australia this year. Despite several campers managing to spear the underground water pipes with star droppers, and the huge demand on the hot water boiler and our plumbing, the “maintenance crew” managed it all with quiet aplomb. Then there was the matter of finding, five or six veterinarians and technical support people required for a ride of this magnitude. 65-year-old Marly van Ditzhuijzen and Eenhoorn's Dahman are the 2013 Dutch Champions after the 160-km*** Dutch Championship at Ermelo, Netherlands, on 18 May 2013. Eenhoorn's Dahman, an 11-year-old stallion, was bred by Van Ditzhuijzen. The pair had been reserve Dutch Champions in 2008 and 2012. Defending Dutch champion Carmen Römer was 2nd (3rd overall) on Oceane D'havenne. This was her 8-year-old mare's first 160-km race. Both riders are hoping to make the Dutch team for the 2013 European Championships that will be held in Most, Czech Republic. Norwegian rider Olaug Espeli Carstensen, riding Al Thaka Mellemgaard, won the competition by 40 seconds over Ditzhuijzen. The 120 km** ride was won by Marjike Visser riding Eomer. If you are 16 or 60, Shahzada is something you HAVE to do……whether it is on your “bucket list” or you just need a benchmark to set all your future goals, this is the challenge for you. If you love your horse and wish you could spend day after day riding in the best country…..this is definitely for you!!!!! Come join us in St Albans from August 25 – 29 for the running of the 33rd Shahzada and try the ultimate test of 400km over five days or if you just want to come and have some fun and get a taste of real endurance riding, the mini marathon of 120km over three days is for you. The ride covers 80kms each day over legendary tracks like Prestons, McKechnie’s, The Steps, Jack’s Track, Boyd’s, Short Wellums, Blue Hill but this year we are hoping to bring back some of the old course like Word of Life, Lyndrian Hill, Derwent’s Track and Baker’s and we will be conducting track clearing weekends which will be announced on Aussie Endurance so come along and help and get a taste of what to expect in August. Heaps of entertainment during the week from Trivia and Poetry nights, Shahzada Idol and the famous dog races…..a great canteen and perfect weather. We like to think of all Shahzada entrants and helpers as part of the Shahzada Family……..everyone helps each other and genuinely wants everyone to succeed and earn that much sought after Shahzada buckle…..so come and give it a go!!! Start planning now – best to be there at least the Saturday before the start at 4am on Monday, 25th and go to the Shahzada website www.shahzadaresults.org and read some of the stories from other riders who took up the challenge. Pre-nom forms and campsite request forms are on the website and please contact Shahzada secretary, Sue Todd on suetodd@activ8.net.au or 0263 79 7218 for any further information. RAF Cranwell, normally home to aircrafts, played host to Endurance Great Britain’s third major national ride last weekend. The event attracted hundreds of riders and horses from across the UK for a competition spread over three days. Brechin based rider John Thomson and his pure bred Arabian gelding Prince Omar made the journey south to join some of his N&T Group team mates, all of whom were scheduled for the big distance race rides of 160kms over two days, one day 80kms and John and Omar in the 100kms CER one day class. In a cloudless early morning the mass start went over the line at 07.31 a.m. Concerns about equine doping and severe injuries in the Middle East are already the worst-kept secrets in FEI endurance. But this niche discipline seems set for wider scrutiny following the Godolphin steroids scandal that rocked the racing world. 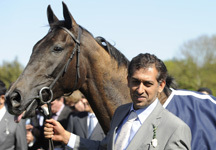 Mahmood al Zarooni, who trained for Sheikh Mohammed’s elite Godolphin operation at Moulton Paddocks, Newmarket, was banned for a record eight years after 11 racehorses tested positive to anabolic steroids, following a spot-check by the British Horseracing Authority (BHA) last month. Al Zarooni also admitted giving steroids to four other horses. Sheikh Mohammed is the ruler of Dubai, one of the seven principalities of the United Arab Emirates (UAE). He personally underpins the global racing economy with worldwide bloodstock investments worth billions and owns an estimated 5,000 racehorses. Endurance racing needed a smooth day out on Friday at Windsor, after the negative publicity that has surrounded it in recent days. The Queen attended, the United Arab Emirates took three of the first four places, and no positive tests were reported — for the moment at least. For those not familiar with this niche equestrian pursuit, an endurance ride involves a course of up to 100 miles long which must be completed by one rider on one horse. It is little wonder that the International Equestrian Federation (FEI) has identified it as a hotspot for chemical enhancement, with 41 cases of doctored horses reported between 2010 and 2012. Figures prepared by the Swiss Equestrian Federation suggest that the Middle Eastern states — which have come to dominate the sport since the 1990s — are at the heart of the problem. Horses from the UAE have repeatedly been cited — even one ridden by the Emir of Dubai, Sheikh Mohammed bin Rashid Al Maktoum, himself. The connections between these mini-scandals and the rather larger debacle at Sheikh Mohammed’s Godolphin stables are not hard to draw. Sheikh Mohammed’s son-in-law, Nasser Bin Hamad Al Khalifa, rode in Friday’s race, although with limited success; his horse Moro Famayev went lame and had to retire after the first 20-mile lap. Speaking to The Daily Telegraph, Prince Nasser — whose father is the King of Bahrain — admitted that doping was a major problem in endurance racing, though he was wise enough to defend Sheikh Mohammed from any accusation of wrong-doing. Royal Windsor’s very first endurance ride was hailed as a great success, with perfect conditions helping to produce some top-class performances. The winner was United Arab Emirates’ (UAE) Abdullah Ghanim Al Marri, who completed the 120km course in a time of four hours, 32 minutes and 34 seconds, riding his 11-year-old grey mare La Crysada. “The race was difficult as this was my first ride abroad and the course was very different to courses in the Emirates but to come here and to enter the history books by winning the first ever Royal Windsor endurance ride is an honour,” said Al Marri. The Organising Committee’smanaging director Fabien Grobon, outlined the major achievements of the last twelve months. He particularly focused on the teams’ daily achievements, as they work towards making these Games an event to live up to both the public’s expectations and enthusiasm. Teams of volunteers will be assigned to assist the media and facilitate the organisation of everyday services. Specific areas will be reserved for the media in close proximity to the Main Media Centre (MMC/CIM) located at the d’Ornano Stadium. Additional media centres will also be placed at all of the competition venues. The control room and broadcasting centre will be set up nearby and television transmission will be handled conjointly by the EBU and the France Télévisions group. Accommodation arrangements have already been finalised. Four hotels will be allocated to journalists, all of which are located close to Caen’s d’Ornano Stadium. Nearly 200 rooms have been pre-booked with rates ranging from 75 to 150 euros (depending on the category of hotel.) Reservations will be possible from 15 May 2013 onwards. A shuttle service will be organised between the media hotels, the MMC/CIM and all the different competition venues. Requests for accreditation will be possible from February 2014 until May 2014. Journalists present in Gothenburg went away with all the information necessary for their forthcoming trip to Normandy. Further dates have been planned for the coming months. Everything has been designed to make the media’s work that little bit easier at the Games! May 5, 2013, Windsor, UK ~ On a very cool day with high winds and occasional heavy showers 48 competitors representing seven countries galloped away from the start with the splendid back drop of Windsor Castle. This was an historic occasion as it was the first time that an endurance ride was included in the events of Royal Windsor Horse Show that was celebrating its 70th anniversary. Abu Dhabi: The Shaikh Mansour Bin Zayed Al Nahyan Global Arabian Horse Flat Racing Festival announced their association with international endurance rides here at a press conference on Monday. Lara Sawaya, Director of the Festival and Head of International Federation of Arabian Horse Racing Authorities (IFAHR) Ladies Racing, said two rides will be held under the banner of the Festival starting with a 160-km ride later this month. “We are proud to announce that the Festival will now be officially involved in two international endurance rides under the directives of Shaikh Mansour Bin Zayed Al Nahyan, Deputy Prime Minister and Minister of Presidential Affair,” Sawaya said. “The first ride is a CEI-O three-star Nation Cup ride which will be over a distance of 160km in Compiegne, France, and will be the last 160-km ride before the World Equestrian Games. There will be participants from all over the world, including from the UAE, and this race will take place on May 24 with pre-inspection on May 23,” she said. Dubai: Rashid Mohammad Ebrahim Al Beloushi did the UAE proud by winning the inaugural Royal Windsor Endurance CEI 2* ride held in association with and presented by the Royal Windsor Horse Show. 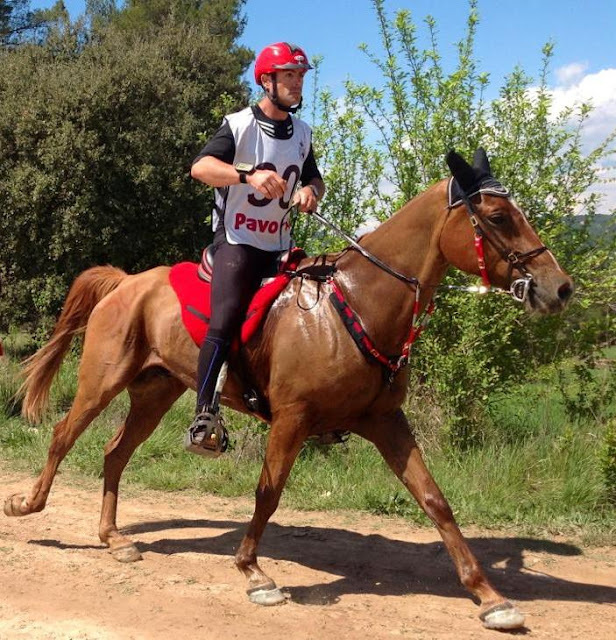 Riding the seven-year-old grey gelding Bucanero, Al Baloushi completed the challenging 120km course around the centuries-old Windsor Great Park in a time of 4 hours, 32 minutes and 34 seconds. Saeed Ahmad Jaber Al Harbi made it a memorable day for the UAE when he finished in second place aboard the 16-year-old Australian mare Castlebar Kadeen. Al Habri timed 4:39:39 secs. Britain’s famous Golden Horseshoe Endurance Ride over Exmoor is including an invitation-only event for Para riders this year. 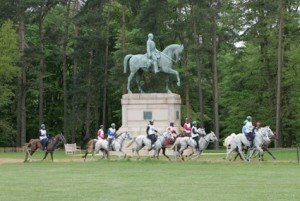 Endurance riding in Great Britain has suffered a huge blow with the Dubai Equestrian Club pulling its blanket sponsorship of Euston Park, axing the Thetford venue’s entire 2013 calendar. The loss of four major race rides — to endurance riding, the equivalent of horse racing losing both Newmarket and Ascot – was announced in a single sentence on Euston Park’s website, which effectively shut down on Wednesday. The national governing body, Endurance GB, has not been offered a reason. The development follows a week of further publicity surrounding doping cases within Sheikh Mohammed’s wider equine interests including Telegraph Sport's disclosure on Wednesday that some 20 horses trained in stables owned by the Maktoum family in Dubai had been involved in FEI doping cases since 2005. Telegraph Sport understands that prior to the revelations that led to Sheikh Mohammed’s racehorse trainer, Mahmood Al Zarooni, being banned for eight years, Endurance GB was already resisting proposals for another "private ride" not under the rules of the International Equestrian Federation (FEI). Sponsored by Events Queensland, it’s only four weeks until Australia’s world famous 160km endurance horse ride begins. The rural township of Kilkivan, located in south-east Queensland, will proudly host the 2013 Tom Quilty Gold Cup from June 7-9. Current national champion, Brook Sample, 38, of Kenilworth, who already has six Quilty Cups to his name, plans to compete again this year and hopes to make 2013 his 7th victory. Brook has competed regularly in this iconic endurance horse ride since reaching the qualifying age of 12. His first 160km ride was the Quilty in South Australia in 1986 when he placed first in the Junior Division. He has ridden in the Quilty 12 times, each time finishing in the top 10 and winning first place in 1990, 1995, 2002, 2009, 2010 and 2012 – a record unmatched by any other Australian endurance rider. It is with regret that EnduranceGB have to inform you that the Dubai Equestrian Club have decided to withdraw their sponsorship from the FEI rides at Euston Park for 2013. This will mean that the Euston Park series of FEI rides will not be available this summer. There are opportunities to compete in FEI rides at Bocconoc, Kings Forest, Seacliffe, Barbury Castle and the College ride in the UK. If it is at all possible to secure one of the Euston Park dates to run an FEI ride elsewhere we will endeavour to seek out the opportunities. We have enjoyed the generosity of the DEC for several years and would hope that this will continue in the future. More than 20 endurance horses trained in Dubai at stables owned variously by Sheikh Mohammed and other senior members of the Maktoum family have been involved in doping cases before the International Equestrian Federation’s (FEI) disciplinary tribunal since 2005. According to publicly available archives, 16 of the horses tested positive in competition to natural or manufactured steroids. Four since 2009 have involved stanozolol, the banned substance found in Sheikh Mohammed’s 11 Godolphin racehorses that led to trainer Mahmood Al Zarooni’s eight-year ban by the British Horseracing Authority. 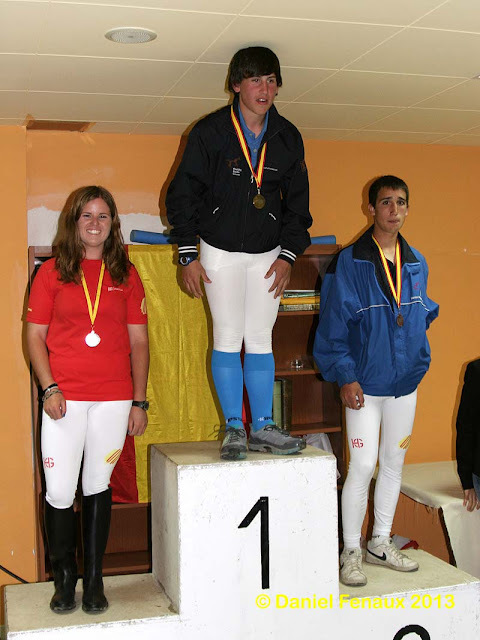 Guillermo Gonzalez and Camerupt won the Spanish Junior/Young Rider Championships on May 4, 2013 in Sant Feliu Sasserra (Barcelona), Spain. Nuria Serrabassa riding Kasbah was second, and Gil Berenguer riding Shagya Irisz was third. The 120 km ride was completed in 6:54.23 at an average of 17.81 kkm/h. Bellingen rider Sharon Foster is all trained up for another year of endurance horse riding. Foster has three horses on a fitness program ready for the endurance season ahead. The Coffs Clarence Endurance Riding Club will be running its annual endurance ride on August 17 and 18. There will be two 20km social rides, a 40km training ride and an 80km competition ride. All horse lovers are welcome. Last year, Foster covered a total of 1500km in training around the state forests in Bellingen. THE closing date to nominate for Australia's international endurance horse ride, the Tom Quilty Gold Cup, has been extended to May 15. The 48th Tom Quilty Gold Cup will be held at Kilkivan from June 7-9, hosted by the Kilkivan Endurance Riders Club (KERC). To qualify for the "Quilty", riders must successfully complete a 160km ride prior to the event. Several lead-up endurance rides were cancelled due to unprecedented weather events including repeated heavy rains and flooding in south-east Queensland since January. The most recent cancellation was the Far-A-Way endurance carnival, due to have been held at Imbil over Easter. Despite the inclement weather and poor ground conditions over the early months of this year being responsible for delays in training programmes and competitive rides, Brechin based rider John Thomson and his pure bred Arabian endurance horse Prince Omar headed south for their first competitive ride of the season. John and Omar joined 130 other combinations at the Endurance Great Britain National ride at Durham Valleys in early April with Team Omar taking on the 82 kilometres class. The route, broken into a series of loops, followed sections of bridleways and disused railway lines making the going ideal for Omar’s flat speed conditioning. Despite a temperature of minus two degrees Celsius in the early morning start, by the time Team Omar came into Vet Gate one the sun was up and the temperature had reached what seemed like a “tropical” 14 degrees Celsius. By this stage Team Omar had covered the first 40 kilometres loop in under two and a half hours. With the crew working flat out Omar was quickly vetted and the second loop covered in a time of two hours and 17 minutes to gain a National 2 award and gold standard. The British Horseracing Authority (BHA), in a recap of a hearing into trainer Mahmood Al Zarooni's admitted use of anabolic steroids in some of his racehorses, called it a "deliberate flouting" of the rules of racing. The BHA published the document April 30, just days after Al Zarooni, who trained for Godolphin, was suspended for eight years for 11 positive tests for ethylestranol and stanozolol. Blood samples were taken from the horses April 9, and the hearing before the BHA Disciplinary Panel was held April 25. "The panel takes a very dim view of the sheer volume of horses who were subjected to these unlawful medication regimes," the BHA said. "This was a widespread systematic misuse of illegal substances which are absolutely prohibited under the rules..."
Jairo Rodriquez and Lyrical Breeze won the Spanish Championships held on May 2 in Sant Feliu Sasserra (Barcelona), Spain. The pair covered the 160 km in 9:28.15, averaging 17.11 km/h. Lyrical Breeze also received the Best Condition award. Laia Muixi riding Flying Tornade finished second, and Bernat Casals riding Dzsamila-P finished 3rd. 10 of 34 starters completed the ride.